Considering Graduate School? Consider Duquesne! After graduation, many DU undergraduate students continue on to earn their master's degrees at Duquesne. Some continue their undergraduate studies in their same field of interest at the graduate level. Others use the opportunity to move into an entirely different field of study. With more than 85 graduate programs, you've got many options to consider. Right now, there are also 25% financial awards on select programs. Leaving the area after graduation? You can live anywhere and earn your master's degree with Duquesne's Online Campus. Programs include leadership, education, nursing, and music. Just visit the graduate program of your choice to learn more about application requirements, curriculum and more. For general questions, you can also contact Todd Eicker, Director of Graduate Admissions, at gradadmissions@duq.edu or 412.396.6219. 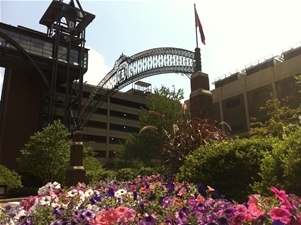 "The sense of community at Duquesne University is strong. Through my various courses in the school of liberal arts, I felt like my professors genuinely cared about my success in their classes. I knew I wanted that same commitment to my education at the graduate level. I like that my program is a good mix of theory and practice. Through my courses, I feel like I am getting a feel for every aspect of communication from interpersonal communication to professional communication and everything in between." "As a student balancing graduate level coursework and a full time job, Duquesne University helps me achieve my goals in higher learning with their flexible class offerings. The biotechnology graduate program feeds my desires to explore a professional career dedicated to serving the scientific community worldwide. Our professors engage us with real world experiences which you do not always find in other graduate programs." "All of the faculty here are very nice and help us gain the best training for our future careers. I get a lot of help from my professors, academic advisor, career service advisor, and writing center tutor. Additionally, I really liked the events held by the international student office and student organizations... like the fright farm tour during Halloween and ice-skating at PPG ."